← Snail Mail. It Does A Heart Good. Thanks for reminding us what a wonderful contribution the space program has given us, far beyond what we’d think or possibly ever recognize. I wish her flight had turned out differently and she had been able to float in space, teach her experiments…but I guess she’s still teaching even now..teaching us all to be brave and try new things and not let fear of the unknown slow us down. I remember where I was that day too. I watched with my classmates as the tragedy struck. We were having a party to celebrate them. At the end of the day, I still wanted to be an astronaut when I grew up. I lived in Tampa, Fl at the time of the explosion and my Uncle worked at the Cape. It was so beyond the beyond– heart-wrenching. Thank you for the personal reminder of how much the space program has contributed to our lives as well as the others who have stepped out with exceptional courage. I will join you for a moment of silence. This was the first national news I remember in my lifetime. I can still see the Time cover. What a beautiful tribute, both to Christa McAuliffe and your grandfather. 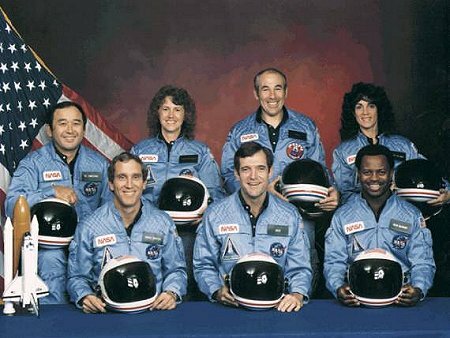 The Challenger disaster shook me to my core. We were all fans of Christa — she was one of us. Wonderful tribute. Thank you for commemorating seven very brave people in such a wonderful tribute. I spent all day on the 28th avoiding reading or listening to anything about the Challenger because I selfishly didn’t want to relive the tragedy and sadness. Then I saw your post and couldn’t turn away. I read every word. Thank you for reminding me that their sacrifice meant so much to so many, including me. Jane, I remember exactly where I was when the Challenger crashed. I remember Christa McAuliffe and her story. This is a necessary and important tribute. I’m taking a moment of silence right now to pay homage to these people who risked their lives in the name of space, expanding new frontiers and progress. I still cry every single time someone says her name. I cannot cannot cannot not cry. I was in class, watching with everyone else. And we looked at each other, and the teacher, and each other. Things like that don’t happen. It was up there with my parents’ divorce on the shake-my-faith-in-everything-I-believe scale. Thanks for the tribute. It’s our generation’s Kennedy’s assassination.